Hoping the storm would pass far from the weekend’s good vibes and music, festival attendees still trickled into Becks Lake in Cantonment, Florida, for the 6th Annual Pass the Good Benefit this past weekend. 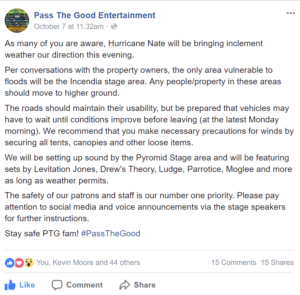 Originally scheduled for October 6-8, 2017, Pass The Good organizers were forced to end the event early as Category 1 Hurricane Nate approached and later hit the Gulf Coast. Reports of a tropical depression in the Caribbean surfaced Wednesday morning, October 4, just hours before Pass the Good Entertainment released the festival stages’ daily music schedules. 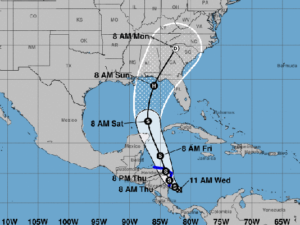 Early forecasts of the storm’s trajectory positioned the eventual-Hurricane Nate to head north and slam the Gulf Coast. That storm path included the Florida panhandle, with the festival grounds situated about 20 miles inland from Pensacola. For the most part, festival organizers, promoters, vendors, artists and attendees carried on as planned, while keeping a wary eye on the storm over the next two days. PTG held their pre-party Thursday night and opened Friday at noon as planned. Day 1’s workshops, events, live paintings, and music sets kicked off throughout the afternoon and into the evening, with some alterations to the music schedule. But by Friday afternoon, news of Saturday evening curfews for cities along the Gulf Coast buzzed among attendees as they set up camp and headed to their first sets of the day. A haze of confusion and hesitation thickened the inescapable Florida humidity, but that did little to dampen the spirits of those who kept their travel plans in the face of an impending storm. 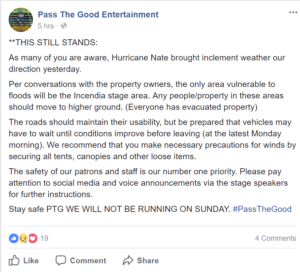 In typical fest fam fashion, it didn’t take long for positivity to brighten the consensual mood about the hurricane’s potential impact on Pass the Good. Initial disappointment about the festival’s presumed early cancellation transformed into a collective goal to make Day 1 the most memorable and enjoyable experience it could be. In that regard, Pass the Good Day 1 did not disappoint. Lingering late-night sets grasped at the fleeting moments before dawn on Saturday, with artists and attendees well-aware that they’d likely have to pack up and leave in just a few hours to avoid the storm. Early Saturday morning, campers who could sleep, slept, while others either continued their revelry or wandered in search of details about what the #*$% was going on. No one wanted to leave or miss a weekend of music, but no one wanted to be trapped onsite all weekend either. Backup plans and assorted side quests quickly dominated conversations shared from campsite to campsite. Meanwhile, PTG organizers had been communicating with the property owners and began disassembling stages and vendor booths in areas they knew would be hardest hit by heavy rains and flooding. They provided attendees with Hurricane Nate and fest-related announcements via loudspeakers and campground word-of-mouth. Many festival attendees began packing up and leaving Becks Lake that morning and afternoon as the storm approached (including River Beats). Few photos and videos of the Saturday festivities mentioned in PTG’s announcement have appeared on social media since, besides one tweet from Ludge, who was included in River Beats’ not-to-miss PTG artist preview. It remains unclear exactly who stuck around or what occurred in the hours leading up to and during the actual storm. Besides any safety-related decision-making from PTG organizers and Becks Lake property owners, logistics involving artist travel also derailed possible alternative plans. On Saturday morning, the nearby Pensacola International Airport announced it would close at 6 p.m. that evening and remain closed Sunday. That closure made air travel to and from the festival more challenging or altogether impossible for many artists performing throughout the three-day event. 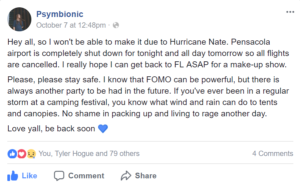 That included Psymbionic, who posted the cancellation of his Sunday headlining set in the PTG Facebook event midday Saturday. “We had a great evacuation plan, thanks to Site Operations. Hurricane Nate made landfall on the U.S. mainland twice, the latter and final time early Sunday morning near Biloxi, Mississippi, as a Category 1 with sustained winds of 85 mph. Nate continued to move inland and was downgraded to a tropical depression Sunday afternoon. As of early Day 3, it seems everyone who produced, performed, vended or attended the festival evacuated safely, which was of utmost importance to all involved. However, several attendees did not leave their campsites the same way they found them. In all likelihood, this was simply due to a hasty exit and concern for personal safety surrounding an impending natural disaster. 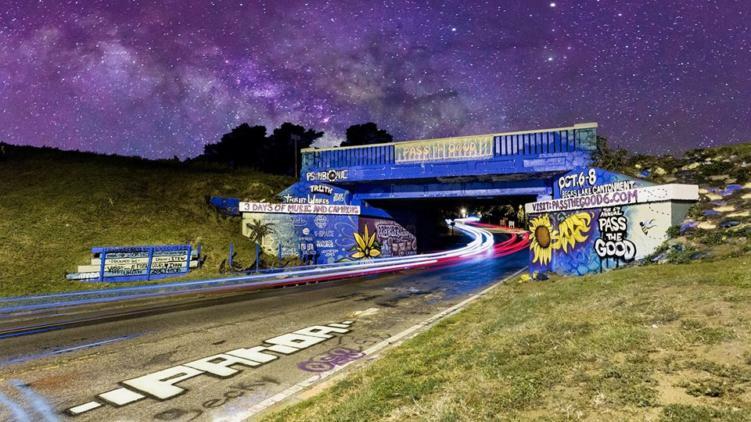 But for the longevity of festival culture, all participants should still try their best to minimize any negative impact on the environment or local community. 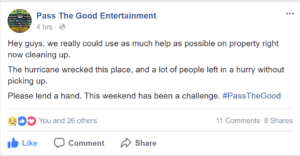 About an hour and a half after their first Sunday post, PTG organizers requested help with onsite cleanup via the fest’s Facebook event page. No updates on final site cleanup were available as of publication, though a handful of attendees expressed on the event’s Facebook page that they’d return to help on Sunday. Props to all who were able to lend a hand! It’s always disappointing for a beloved music event to be canceled. But what’s most important is that everyone involved and in attendance at Pass the Good 2017 was safe, and the local community did not suffer significant damage as a result of Hurricane Nate. We’ll hope for another shot at Pass the Good in 2018. Featured image via Pass the Good Facebook page.